Low default rates, a lack of alternatives and foreign demand will support high-yield bonds in 2018. Yet with spreads near record lows, covenants weak and leverage rising, the seeds of a bear market are plentiful. Investors should keep a wary eye for the first shoots of trouble. 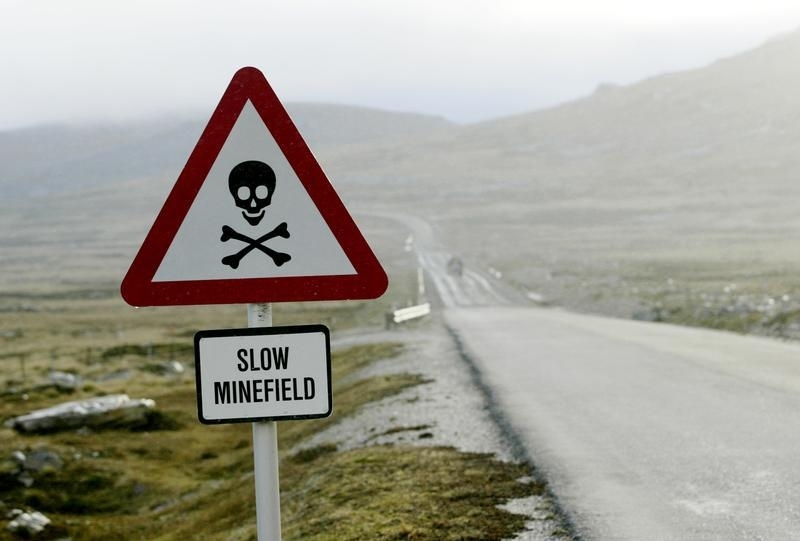 Sign placed on a side road warns locals to beware of landmines in Stanley on September 6, 2005. The yield premium on high-yield bonds relative to comparable U.S. Treasuries hit 3.61 percentage points at the end of November, down a full point from a year earlier and near the post-crisis low of 3.35 percent set in June 2014, according to Bank of America Merrill Lynch. The spread has not traded consistently below that level since the eve of the financial crisis in 2006 and the first half of 2007.